Blocked artery symptoms include chest pain, especially when exercising. The difference between a normal artery and an artery narrowed by artherosclerotic plaque. What causes coronary artery disease (CAD) is a process called atherosclerosis. Symptoms develop when cholesterol, fats, and other substances such as white blood cells collect in the walls of the blood vessels that keep the heart supplied with blood—the coronary arteries. Cholesterol and other materials form plaques. Unfortunately, atherosclerosis symptoms don’t often show up until your condition worsens. When plaques first form, they’re soft. But they can rupture, releasing the “junk” inside. The plaques then turn hard and narrow. If plaque build-up is too great, blood can no longer flow and the result is one of the most serious blocked artery symptoms of all: a heart attack. Before you get to the stage of CAD that ends up with a heart attack, you should learn about atherosclerosis symptoms that indicate CAD. These signs suggest that heart disease is developing and a heart attack could be in your future. 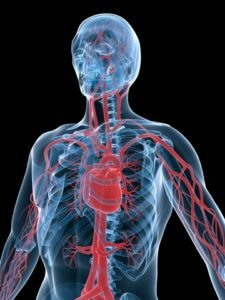 The most noticeable and serious blocked artery symptom is angina, the clinical term for chest pain caused by reduced blood flow to the heart. When your heart muscle isn’t getting quite enough oxygenated blood from the coronary arteries, you may feel pressure or tightness in your chest. You can have angina for years without ever having a heart attack. But it’s important to pay attention to the frequency and intensity of angina episodes and other atherosclerosis symptoms because they can signal a change in your condition. Angina exists in two forms: stable and unstable angina. Stable angina is a blocked artery symptom that is fairly predictable. If your chest starts to feel tight or painful after you do some yard work or exercise but you seldom if ever feel pain when you’re resting, it’s probably stable angina. Unstable angina can appear at any time. You might be sitting in your favorite chair watching TV and suddenly feel a smothering sensation in your chest. That’s unstable angina and it’s much more dangerous than stable angina. Unstable angina puts you at a higher risk for a heart attack, so it’s vital that you discuss angina and other possible atherosclerosis symptoms with your doctor. Atherosclerosis isn’t limited to the arteries of the heart. You can have blocked arteries in the smaller blood vessels of the legs. This is called peripheral artery disease (PAD). The typical atherosclerosis symptom associated with PAD is pain that increases when walking and subsides with rest. A test called a brachial ankle index, which reveals abnormal blood pressure in the arteries of the legs, can help diagnose PAD. You may also have a blocked carotid artery, which carries blood to the brain. The most serious symptom of carotid artery disease is a stroke, which occurs when blood flow to the brain is blocked. Your doctor may be able to detect blockage in a carotid artery just by listening to blood flow with a stethoscope. Other tests can confirm the presence and extent of plaque in the carotid arteries. Whether or not you notice any blocked artery symptoms—anywhere in the body—it’s important to remember that if you have blockage in one blood vessel, there’s a good chance you have it elsewhere, too. 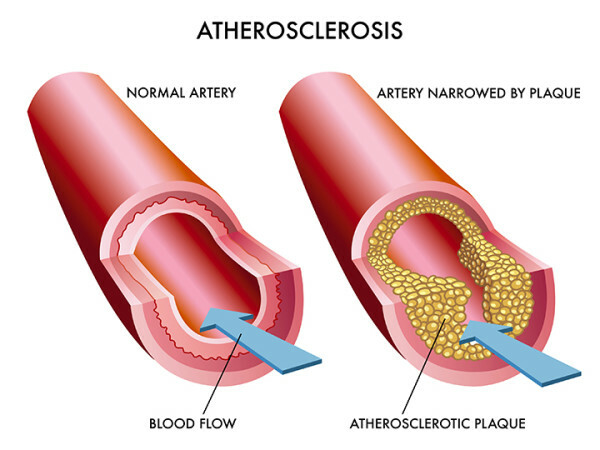 So if you get a diagnosis of peripheral artery disease or carotid artery disease, be sure to talk with your doctor about screening for atherosclerosis in your other arteries, too. a heart attack, angina, angina symptoms, artery disease, atherosclerosis, atherosclerosis symptoms, blocked artery symptoms, blood pressure, brain, chest pain, cholesterol, coronary, coronary arteries, coronary artery disease, exercise, having a heart attack, heart attack, heart disease, heart muscle, muscle, pain, peripheral artery disease, stable angina, stroke, stroke risk, unstable angina, white blood cells.